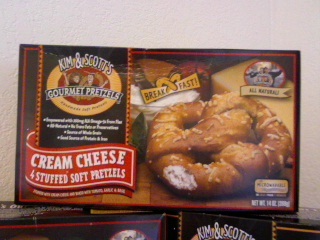 Kim & Scotts Gourmet Pretzel's : We met at a Chicago book signing by a wondrous author, Richard Bach, who writes about soulmates and airplanes. We decided to express our joy by flying high together inside a passionate soft pretzel business and nurture the world with our deliciously twisted and inspired products. 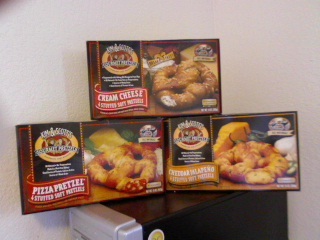 We’ve added a unique twist to the ancient pretzel by creating a variety of delicious flavors, using custom recipes and premium ingredients. Twisted by hand and baked from scratch, our unique soft pretzels make a wonderful snack anytime! Isn't that just ... (So Sweet!) ..I love this story! Kim & Scott was amazing enough to not only send me some of their Yummy pretzel's, But let me pick them out! So as I am always saying when it comes to "Foodie" reviews he is always first in line to try them out. So I told him that He can pick one, I can pick one, And we will pick one out together. So he picked out the Cheddar jalapeno , I picked out the Cream cheese, And we both wanted the Pizza one together. The pretzels arrived in a big box and inside the box was a big white Styrofoam container with a lid, The container had the boxes of pretzels and to my amazement the box was still cold, and the pretzels was frozen. Tucked inside was a bag of dry ice.. I'm always saying that I love to recycle everything possible so I kept the big Styrofoam container for storage, or to keep fish in when my husband and I go fishing this summer. and my husband had to play with the dry ice. He grabbed a bowl and tossed the dry ice in water. Jalapeno Cheddar: This Yummy soft pretezel had melted cheese on top as you can see in the picture, It was frozen solid but just popping this bad boy in the microwave for 55-60 seconds and it was good as new! It was soft and moist. It had melted cheddar cheese tucked in side with piece of Jalapeno, My body doesn't like spicy foods but I tried some to see what it was like. It was delicious other then the spicy kick that it had to it. But husband loved it. 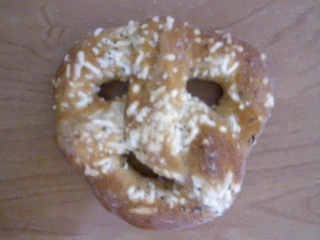 Cream Cheese: This was one happy pretzel to know it was about to be eaten, Can you see it's smiling face in the picture to the left? .. It wanted to be eaten and was happy that I was going to. 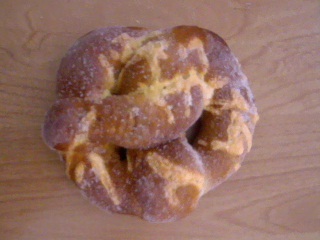 This soft pretzel was stuffed full of a stringy cream cheese flavor cheese. It was frozen solid but for 55-60 seconds in the microwave it was soft, Yummy and had an awesome cream cheese flavor that I love. Only thing that would have made this better is salt on top and maybe some strawberry sauce with the cream cheese. 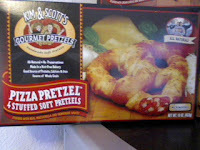 At first taste I was NOT impressed by the pizza Pretzel at all! I don't know if it was the favor of the seasonings or the pizza sauce that is stuffed inside. But I couldn't handle it and gave them to my husband because he said this was his favorite kind out of all of them and then the Jalepeno flavor. But then I came up with an idea! I grabbed a bowl and poured some buttermilk ranch into a bowl cut a piece off and dipped it into the ranch. YUMMY! It was a whole different experience! That should be a flavor that Kim & Scott should consider..Buttermilk ranch or provide a buttermilk ranch packets into the box. 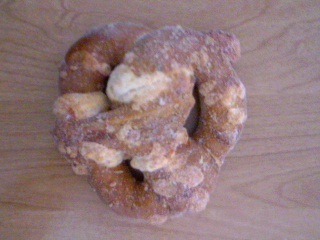 It tasted like a Pretzel calzone. So the end tasting was delicious and become my favorite out of all three. 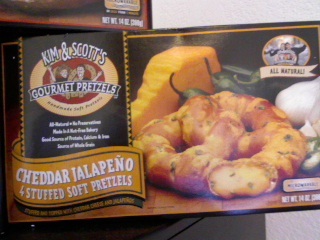 They were all really delicious and would recommend Kim & Scott's Gourmet pretzels to anyone! ♥ I receive no monetary compensation for this review. I was provided a Kim & Scott's Gourmet Pretzels to try and give my honest opinion.